The critical points of a function tell us a lot about a given function. That's why they're given so much importance and why you're required to know how to find them. In this page we'll talk about the intuition for critical points and why they are important. After that, we'll go over some examples of how to find them. Critical points are special points on a function. For example, when you look at the graph below, you've got to tell that the point x=0 has something that makes it different from the others. 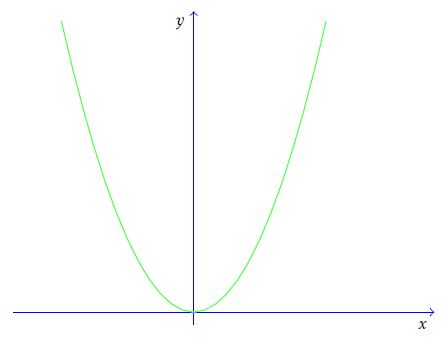 Given a function f(x), a critical point of the function is a value x such that f'(x)=0. That is, it is a point where the derivative is zero. The most important property of critical points is that they are related to the maximums and minimums of a function. More precisely, a point of maximum or minimum must be a critical point. The converse is not true, though. That is, a point can be critical without being a point of maximum or minimum. What do I mean when I say a point of maximum or minimum? I am talking about a point where the function has a value greater than any other value near it. For example, the following function has a maximum at x=a, and a minimum at x=b. This function has a maximum at x=a and a minimum at x=b. These are local maximum and minimum. Note that a maximum isn't necessarily the maximum value the function takes. This can be misleading. When we say maximum we usually mean a local maximum. 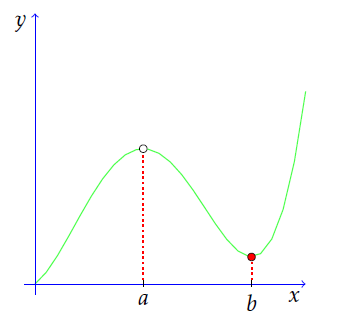 At x=a, the function above assumes a value that is maximum for points on an interval around a. The same goes for the minimum at x=b. Knowing the minimums and maximums of a function can be valuable. A point of maximum or minimum is called an extreme point. We'll see a concrete application of this concept on the page about optimization problems. Let's see now some examples of how this is done. This means the only critical point of this function is at x=0. 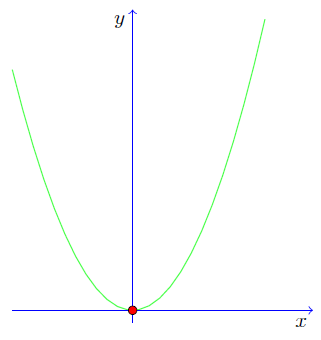 We've already seen the graph of this function above, and we can see that this critical point is a point of minimum. 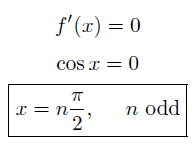 The function f(x) = x2 has a point of minimum at x=0. 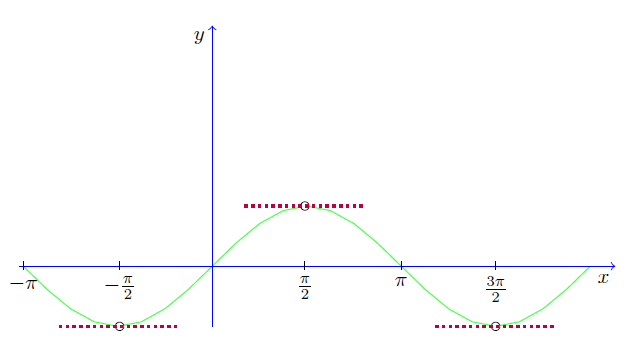 The function sin(x) has infinite critical points. They are either points of maximum or minimum. Now, we solve the equation f'(x)=0. 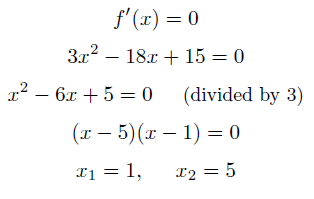 This is a quadratic equation that can be solved in many different ways, but the easiest thing to do is to solve it by factoring. This function has two critical points, one at x=1 and other at x=5. That's it for now. If you still have any doubt about critical points, you can leave a comment below.